I’m the guy who holds onto computers too long. I keep them until they’re simply not usable, period. For the most part, though, it’s not the hardware that dies. I have a 7-year-old laptop that looks brand-new other than the layer of dust on it. For the most part the victim is the updates. Brand new computers come from the factory designed to work perfectly. They often have special drivers that let them work with the latest operating systems and they are designed with those operating systems in mind. And then, time passes. On average, I would say that my computers receive about 120 updates a year. About one every third day. And each one takes my PC closer to oblivion. Some updates add security features. These almost always slow the computer down by checking for some security flaw every time I do anything. I’m not saying I don’t appreciate it, but every one of them slows my computer down. Some updates add new functions. Everyone loves these but let’s be honest they’re few and far between and there’s no guarantee they won’t slow the computer down too. What I don’t understand about feature improvements is that they happen so rarely, why don’t manufacturers shout about them? You get a lot of vague talk about “miscellaneous improvements” but why aren’t they just saying “You can actually do things better and easier because ‘x’! !” I would. Some updates are bug fixes. Most of the time they fix bugs you didn’t know you had because software testing already caught the really big bugs, hopefully. And then, there are the big boys. Operating system updates. These have killed more PCs for me than anything else. 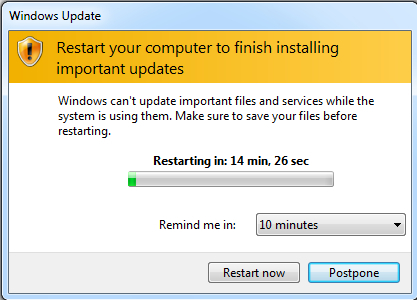 I remember trying to install Windows Vista on a laptop and after 21 hours of updating, the thing just stopped working. That was a fun weekend. Operating system upgrades bring fresh features and a new look to your computer. They make everything seem fresh and new. And, more often than not they kill your computer slowly from the inside. Those custom drivers designed for your computer? Gone, replaced with generic ones. If you’re lucky the manufacturer has new custom drivers, but usually you’re not that lucky. You’ll lose access to ports, have weird errors, and end up rebooting a lot. Around the time you’ve had your computer four years or so you’re beginning to think it’s a conspiracy, because this once speedy device slows to a crawl when you start it up. You’ll probably start all over again with a new computer. And realistically, that may be your only hope. You see, you could probably restore your computer to its factory condition. Most computers come with what are called “recovery partitions” that let you take the computer back to its original, shiny new state. That will work… for about a day. Because all those updates you missed — all 500 or so — will start to install themselves. Even if you decide not to do those operating system updates, you’re still going to find things have slowed down interminably. It’s a vicious cycle. People get new computers because they eventually slow down, and hardware manufacturers don’t make computers upgradeable so that you could keep up with the latest and greatest software. New features need newer, faster hardware, and today more than ever it’s practically impossible to upgrade a PC. It doesn’t have to be like that, but people want it to be like that. Most folks complain but when all is said and done they actually want to upgrade to something new and shiny every few years. If they didn’t, computer makers would get smart and come up with computers that could be upgraded. Has the time finally come for USB-C? Blowout Sale on Satellite Dishes!